I’ll be honest, I was seriously tempted to give up on this hat a couple of times. The pattern calls for “chunky” yarn. So, when my sister asked me over the phone what kind of yarn I’d need to make a bomber hat for her, I couldn’t remember whether the Lion Wool-ease Thick and Quick yarn I’d used before was bulky (category 5) or super bulky (category 6). So, it came to pass that I ended up with 2 skeins of Lion Jiffy sent via personal messenger (my mom) from the southeast corner of the country to the northwest. That’s when I discovered the mismatch in yarn weights. Undeterred, I figured I’d just make a few modifications and everything would just work out… And of course, after a few false starts it did. I tried a few options to avoid modifying the pattern, including just using larger hook sizes. I didn’t think the hat looked right with more space between the stitches. I ended up using a US J/6.0 mm hook. If I had it to do over again, I’d probably go down to an I/5.5 mm or H/5.0mm hook so the fabric would be a little more solid. Fortunately, the pattern revisions followed by blocking resulted in a hat I was happy with. I daresay that my sister was happy with it, too. Without further ado, here’s what you need to do to make The Bomber with bulky weight yarn instead of super bulky (adult size only). More stitches in the main part of the hat. I increased up to 54. I probably only needed to go to about 48-50, but 54 worked, too. Lengthen the ear flaps. I added 3 rows: 1 nondecreasing row after patterns rows and 2 nondecreasing rows after pattern row 3. Note that this does flip the pattern in terms of which direction you’re going. 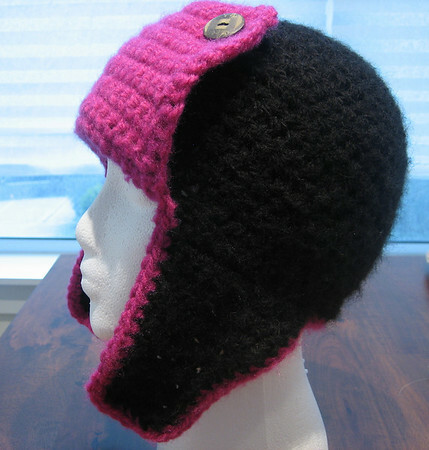 For example, normally you’d start row 4 in the 1st earflap by decreasing at the end of the row. If you follow these modifications, you’ll be coming from the opposite direction on row 4 (now row 7 since you’ve added 3 rows), and you’ll need to decrease at the start of the row instead to keep the earflap shape the same.